It’s easy to see the thrill of thrift store shopping. It gives DIY framers the chance to find something interesting but in need of TLC and transform it into a vibrant focal point. And resale shops are full of neglected artwork begging to be paired with a new frame and mat and injected with new life. But thrift store finds can present unique challenges. It’s impossible to tell what kinds of materials were originally used to frame them. 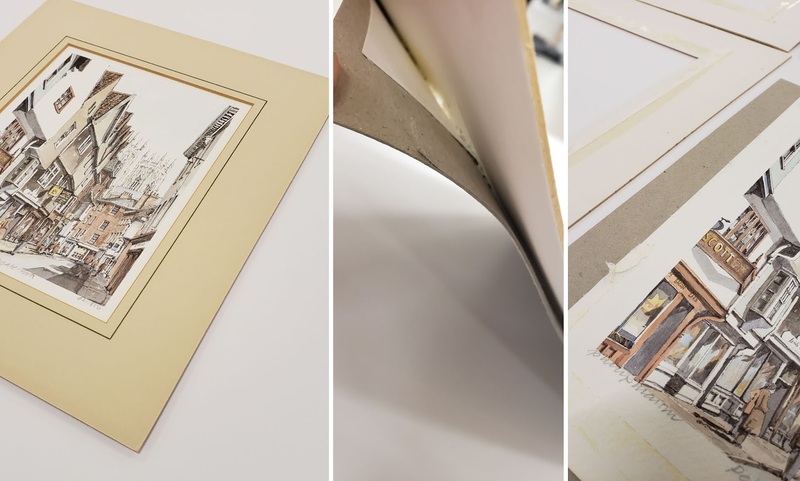 If conservation-quality materials were not used, removing the frame and backing materials could reveal yellowing and damage. There are other questions that can’t be answered until the frame comes off: Was the artwork mounted with glue or transfer tape, or was it dry mounted? Will it be easy to remove the backing materials and mats, or will doing so tear the artwork? Has the artwork attached itself to the glazing? Until you start removing the old frame, everything’s a mystery. 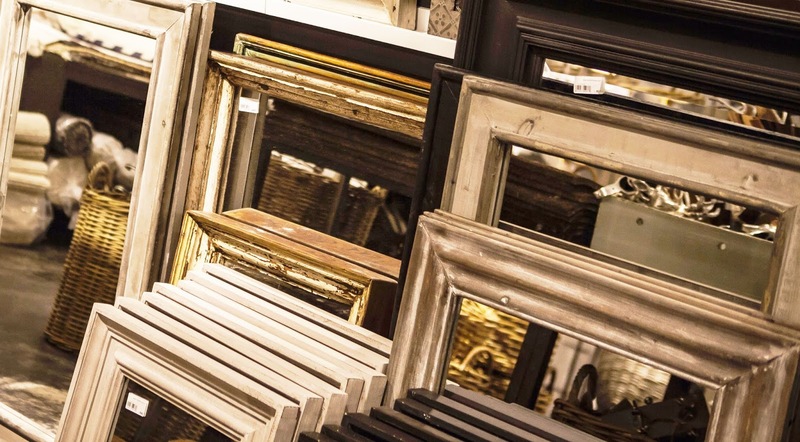 Recently, we embarked on our own thrift store reframe project, and we faced the same challenges. 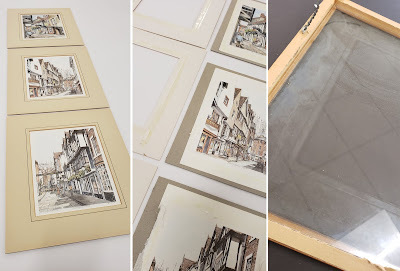 We located three watercolor prints depicting the streets of York, England at resale shop. As soon as we took the dust cover off the backs and removed the points, we realized the original materials were not conservation grade. The backing of each piece was corrugated cardboard and the watercolor artwork was fastened with either tape or glue to a second piece of corrugated cardboard. Though cardboard is not acid-free and can damage artwork, we decided against removing the cardboard attached to the watercolors because we didn’t want to further damage them. When it came to the mats, however, we decided to take our chances. They were dirty, and acids had already begun to turn their cores brown, so we opted to carefully remove them. Then came the new frame treatment. Since we couldn’t detach the cardboard from the art, we needed to incorporate acid-free materials wherever we could. ArtCare mats were the perfect choice. They contain patented microchambers that trap and neutralize acids to help actively protect artwork. Since the art and signature were starting to fade from the pieces, we chose UV protected acrylic glazing to prevent further loss. The artwork needed a modern touch, so we chose to frame all three pieces together vertically in one frame with a custom-designed mat. 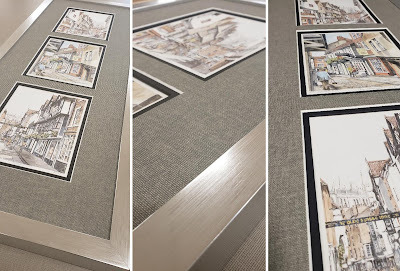 We selected a Silver Wood picture frame and layered several mats. For the bottom layer, we used an AlphaEssentials mat with a solid core in black to outline each image, and then put a rich linen textured Bainbridge Artcare AlphaLinen mat in Heather Grey on top. “I think the reframe project turned out great and it was completely worth the hour or so it took,” Showroom Manager Lindsey Harrison said. Need help with your framing project? Explore our How-To section or contact us. Architects need to end up more mindful of precisely what is engaged with planning hindrance free structures and homes. I like inside enrichment, so I may accomplish something in that. I may Write Essay eventually, take two years off to examine inside design. Inside embellishment mostly blossoms with being social. That Heather Grey mat board is fabulous. I really need to find a way to use it with my artwork! how do you make the new mat fit the old frame? This gives me hope that when I find a hidden gem at Goodwill, it can be reframed and refreshed!